As some of you may know, the BBC recently came up to the site to do some filming for a new early evening magazine show. The short segmented hosted by Dan Snow is expected to air on Tuesday 22nd August 2006 on the BBC 1 Show called "The One Show". The show runs from 6:55pm - 7:30pm. Unfortunately, we can not give a more exact time, but we hope you will be able to watch it. The programme should prove especially interesting as it has new, as yet unseen arial footage of the site. We will endeavor to get a copy of the segment up on the site to view. The Lost City of Trellech project has been fortunate enough to be featured on a number of websites and internet forums over the years. This area of the site tries to bring together all of this information in one easy reference. We always delighted to hear about people discuss the project and to see when we get a mention. However, we obviously are not always aware of what is published, so if you manage to see us mentioned somewhere please let us know and we will add it to the site. Country File -Country File were kind enough to suggest us as a good place to volunteer. Trellech Article - Article discuss the foundations of the LostCity. Urban 75 - Discussion on forum about the project. Wikipedia - Wikipedia entry on our esteemed leader. Humanist Heritage - Suggesting the LostCity as a place of importance history. Current Archaeology - General information about the site and volunteering. archaeofeed.com - We were listed in Archaeofeed’s 2016 Archaeology Awards. 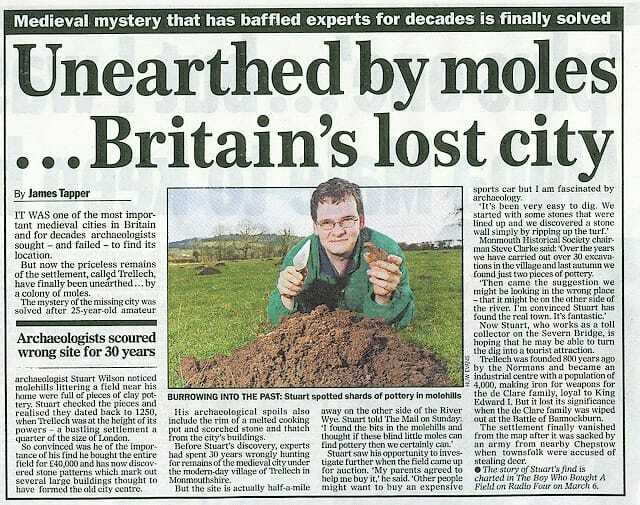 Daily Mail - Newspaper article covering the story of "The Boy who bought a field"
Caldicot U3A - Caldicot U3A came on a group visit and have posted some photos online. SWAG - SWAG visited us and posted a nice summary of the trip with photos. Wikipedia - General information about Trellech with a nod to it's past. Trellech Primary School - Trellech Primary school is just up the road from the site and gave us a mention.